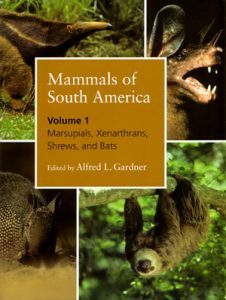 Mammals of South America, volume one: marsupials, Xenarthrans, shrews, and bats. Artist/Author: Gardner, Alfred L., editor. The terrain between Panama and Tierra del Fuego contains some of the richest mammalian fauna. Containing identification keys and brief descriptions of each order, family, and genus, this first volume of the three part series covers marsupials, shrews, armadillos, sloths, anteaters, and bats. 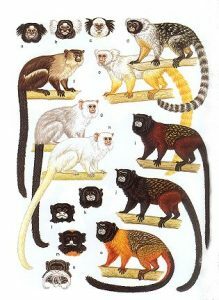 Species accounts include taxonomic descriptions, synonymies, keys to identification, distributions with maps and a gazetteer of marginal localities, lists of recognized subspecies, brief summaries of natural history information, and discussions of issues related to taxonomic interpretations. Includes maps but no illustrations. Volumes two [stock id 31614] and three [stock id 31615] are in preparation, no due date. Provides the snapshot of South American fauna. With 252 photographs, this work presents descriptions of each of the mammal families found on the South American continent; and reveals the diversity of these incredible animals. It includes details about the “third eyelid” of the manatee, the strange hair of sloths, how vampire bats actually feed, and more. From marsupials to bats to carnivores to cetaceans, fully one-fourth of the world’s mammals can be found on the South American continent. Rexford D. Lord provides the most vivid snapshot of South American fauna ever produced. Artist/Author: Eisenberg, John F. and Kent H. Redford. 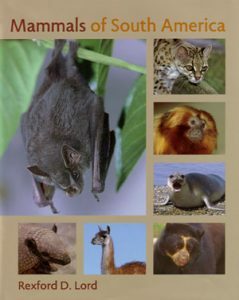 This volume in the series provides a survey and synthesis of current knowledge of the more than 650 species of land and marine mammals found in Ecuador, Peru, Bolivia, and Brazil, as well as information on the mammalian fossil record, current biodiversity, and biogeography of this region. Chapters present up-to-date taxonomic information, ecological and behavioural characteristics, conservation status, and distribution maps for most species. Volumes one and two are out of print.